During our visit to Balik Pulau in search of durian, my father dragged me over to this cart and insisted I take some photos and record a video of the hawker at work. I’m not posting the video — mostly because the audio that comes with it consists of my father poking me and asking over and over if I’m doing it properly and me protesting back that yes I was taping it and if he’d stop poking me the camera wouldn’t shake. I am posting a photograph though, because the scene was actually quite interesting. The hawker is frying noodles on the side of the road. 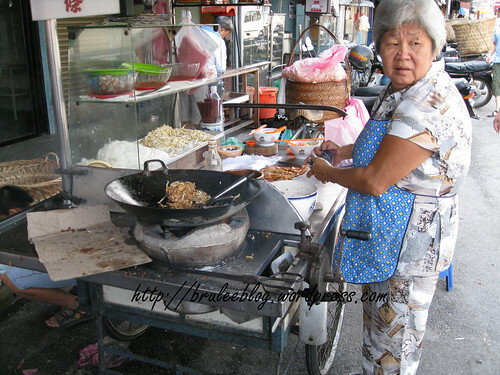 I love the image of her cart because it’s on wheels and at the same time practically contains a whole kitchen, complete with a wok and fire. Yes, real fire. When she turned the crank (visible over by her apron), it manually spun a metal fan, which in turn fanned the flames and increased the heat. I can’t comment on the food however, as we didn’t buy any of it. I did feel a bit guilty that I took photos and videos of her without purchasing something, but we had a van full of people wondering why on Earth the two of us were staring at some lady frying noodles when we were all supposed to be in the van and travelling back to Georgetown. Van full of angry people > my guilt. You can’t go to Malaysia and not eat some durian. Unfortunately. For this dreaded moment, we took a car trip to a small town called Balik Pulau, located in another part of Penang. The ride was actually quite interesting as we saw parts of the coast, as well as forests and plantations. 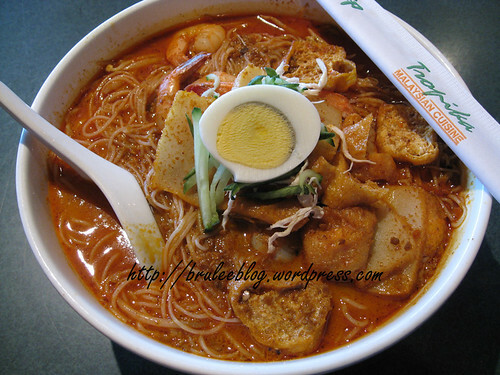 Balik Pulau is famous for its access to durian and apparently for its Penang assam laksa. 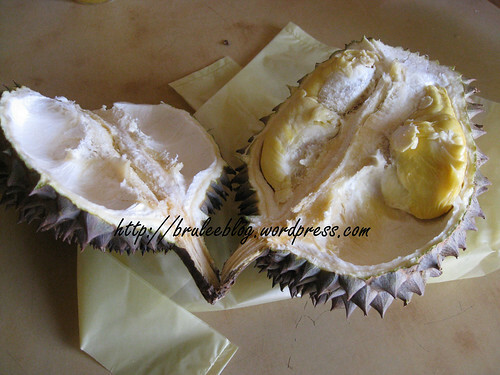 Durian is an acquired taste that is not for everyone. The fruit with a sharp, spiky skin. Inside are soft globes of edible fruit, with a large seed inside each piece. Texturally, the fruit is creamy. Taste-wise and smell… well, try imagining something left in the gutter to rot for days. There’s a very good reason why this stuff is banned from hotel rooms. As you can tell, I am not a fan. Durian is also one of those things that my father insists on getting me to try over and over again despite my protests. And the other lie is that when it’s fresh it’s milder and creamier. I can’t dispute the creaminess, but the taste was still nasty. I told him it was the absolute very last time I was ever eating it. Hopefully he actually believes me this time. 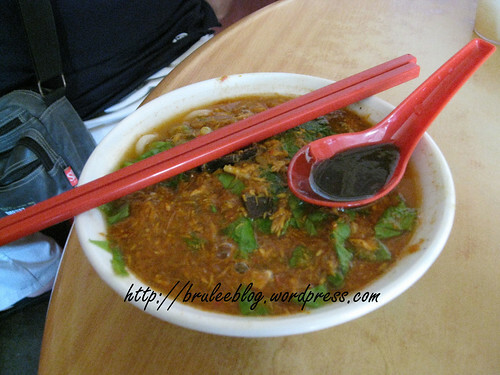 While in Balik Pulau I also tried some Penang assam laksa – you can see from the photo that this is one had a lot more fish in it than the other photo I posted earlier. The flavour was good too, but not as good as my favourite one back in Georgetown. I also had a sip of some nutmeg juice, made from the fruit of the nutmeg (nutmeg spice is made from the seeds). It was slightly bitter but refreshing at the same time. Probably not something I’d want to drink again, but definitely interesting to try. I had curry mee twice during my trip. 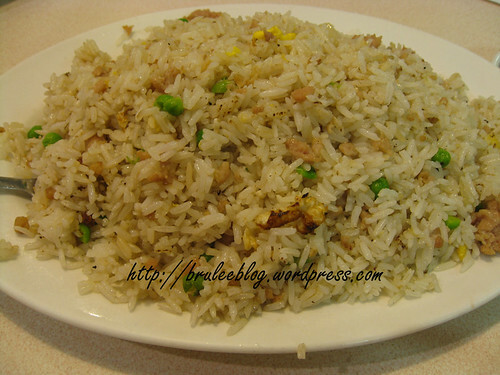 The first was at a small place in Langkawi, an island in Malaysia that is popular for its beach resorts. I don’t remember the name of the place but it was like a mini-cafeteria in a strip-mall near Underwater World, and sold a variety of Malaysian and western foods. The burgers apparently sucked somewhat and the Hainanese chicken rice was so-so. 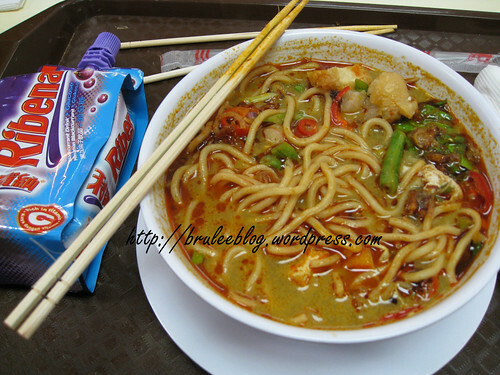 I had curry mee and Ribena, a blackcurrent drink popular in parts of Asia and in the United Kingdom. The curry mee wasn’t bad. 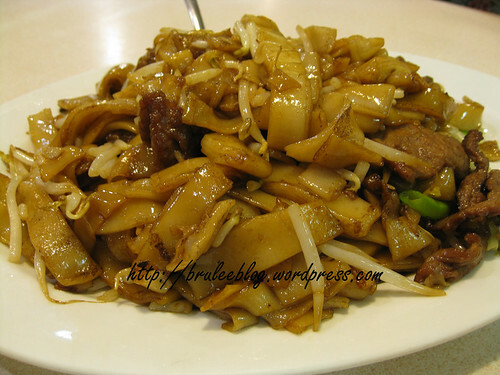 Decent spicing, vegetables weren’t too soggy… I just wish there had been more of them and a little less noodles. This photo is also the current image header for this blog, which I wrote about earlier. And yes, I was mocked by my father for buying Ribena (adults usually see this as a kid’s drink). And then I was laughed at for taking a photo of it. But hey, I like the taste and it has vitamin C.